Surrounded by his family, Javier Vela II, 25, is sworn in by Starr County Judge Eloy Vera Monday as constable for Precinct 4. RIO GRANDE CITY — Starr County’s Precinct 4 has a new constable replacing the previous holder who was unable to obtain the necessary license. 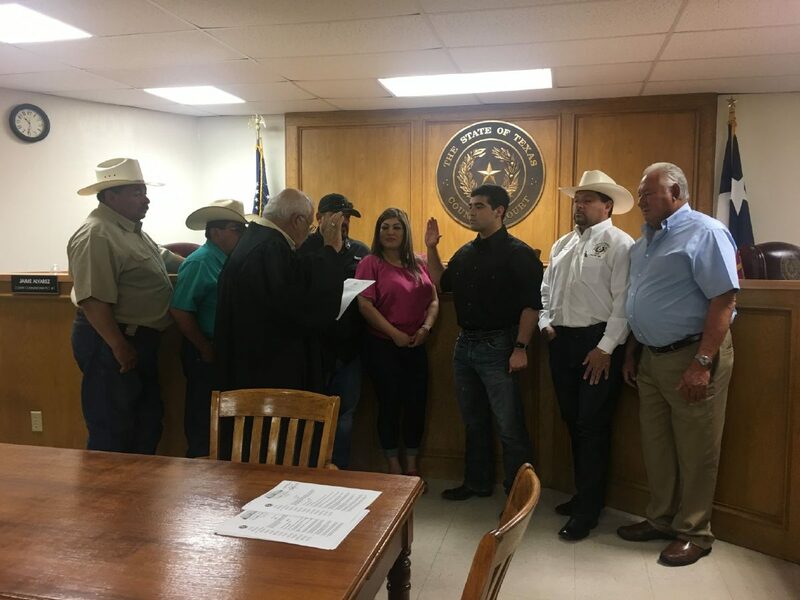 Javier Vela II was sworn in as the constable for Precinct 4 during commissioners court Monday morning, replacing the previous constable, Jaime Martinez, who failed to obtain his peace officer’s license within the allotted time. Vela, 25, was a deputy with the Starr County Sheriff’s Office for five months before taking his new role. Prior to serving in the sheriff’s office, he was a police officer for the Rio Grande City school district for three years and a correctional officer with the Texas Department of Criminal Justice for five months before enrolling in the academy. When asked if he was nervous about his first role in public office, he said he wasn’t but instead was ex-hausted after working all night with the sheriff’s office. Martinez, his predecessor, was one of two constables elected in November 2016 without their peace officer’s license. While Daniel Muñiz — who was elected constable for Precinct 1 — was removed from office because a previous misdemeanor conviction prevented him from qualifying for the license, Martinez was allowed to remain in office as state law allowed a 270-day grace period to obtain the license. Martinez enrolled in a six-month course curriculum administered by the Lower Rio Grande Valley Development Council; however, he did not pass the cumulative final exam.